For anyone that is considering joining a CSA, I must issue a warning. You had better like greens. Collard greens, beet greens, kale, more kale, mustard greens, turnip greens. We were so grateful last year to be accepted into the Crown Point CSA, and worked very hard to not waste any of our share. We cut the greens off the beets and turnips. We rejuvenated wilted greens by soaking in cold water overnight in the fridge. We saved everything. This meant a lot of creative veggie-centric meals, and a lot of putting up. Alex, the resident bearded dragon, ate like a king (er, queen – as we found out last summer). The greens we couldn’t consume, we froze. So, now, in February, we are reaching the bottom of the cold storage. We’re down to one head of cabbage, a few turnips, and a couple onions. Last week we finished the squash and potatoes. Now we turn our attention to the remainder of the veggies in the freezer. AND THERE ARE A LOT OF GREENS. So my new strategy when looking for a recipe is to always include “with greens” in my search terms. Last week, searching for “veggie burgers with greens”, I found this blog. In my variation on her recipe, I used red lentils and beet greens. Quite accidentally I made veggie burgers that looked like real hamburger. Here’s what I did. 1. Combine lentils with 2 1/2 cups of water and bring to a boil. Reduce heat to medium-low, cover, simmer for 20-25 minutes, until lentils are cooked. Stir occasionally. Drain well in fine mesh strainer. Yields about 2 cups of cooked lentils. 2. Heat 1 tbsp oil in skillet, add onion and saute until translucent. Add garlic and greens and cook until the greens are softened (time varies by greens – my thawed beet greens took about 5-6 minutes). 3. While the greens are cooking combine the cooked lentils, turnip, pine nuts, eggs, soy sauce, and herbs in a large bowl. 4. Drain excess moisture from greens and add to mixture. 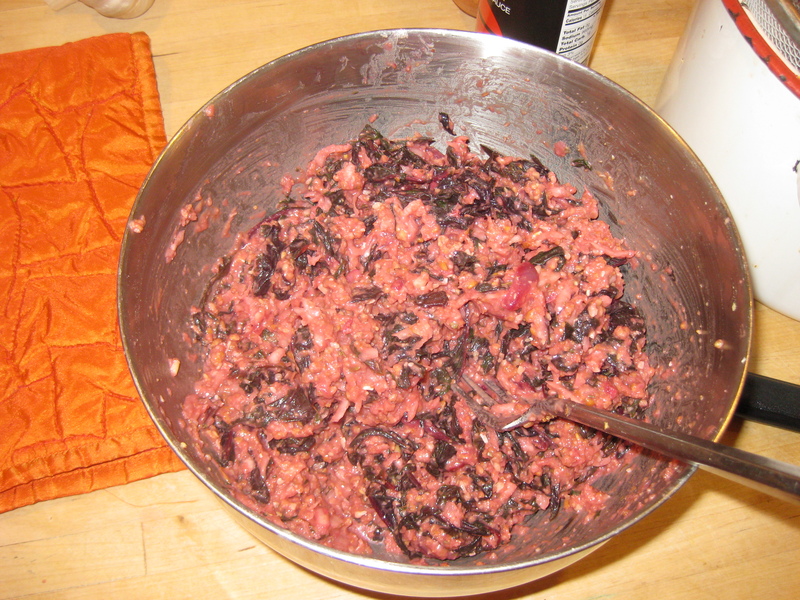 This is when the slightly pink mixture turned RED from the beet greens and began to resemble…well…hamburger. 5. Add cracker or bread crumbs until the mixture is no longer wet. It should be as dry as you can get it while still able to hold together easily. I used an entire box of Kashi TLC crackers plus several slices of bread. But then I didn’t drain my greens very well. 6. Form the mixture into patties. These can be refrigerated or frozen for later use. 7. When ready to cook, heat 1-2 Tbsp of oil in skillet, and add patties. 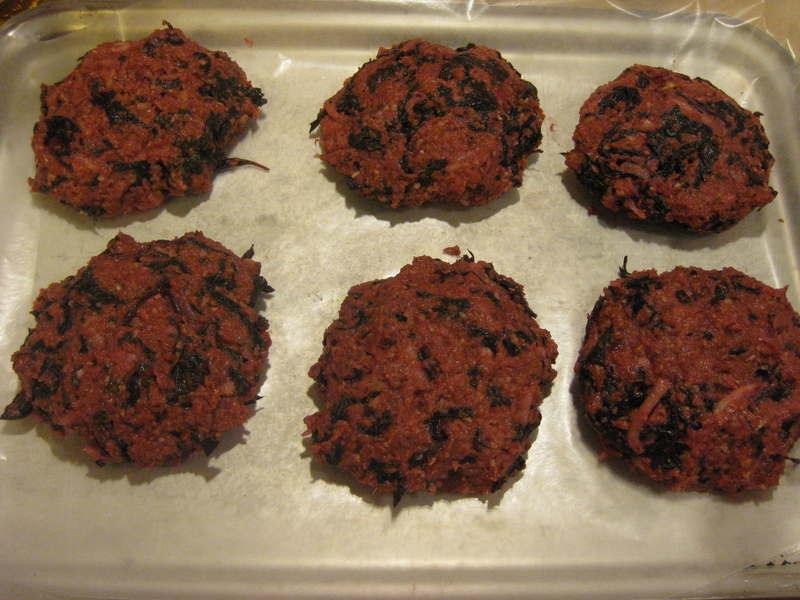 Cook 3-4 minutes per side, patties should be nicely browned on each side. I didn’t get a picture of the finished burgers (we ate them immediately! ), but my vegetarian friend mistook them for beef hamburgers. Now obviously they didn’t taste like beef hamburgers, but they were delicious!! We served on homemade buns, with all the usual burger fixings – pickles, mustard, Heinz Organic Ketchup (made with SUGAR not HFCS), local cheese. This made 9 thick patties. Next time, I’d make the patties thinner, so they’d be crisper overall, but it’s a personal preference. We froze the patties we didn’t use. I’ll definitely make these again.